In conjunction with Chicago Magazine’s annual Top Doctor’s issue, the publication launched Top Doctor videos and profiles on its website. Dr. Chudik’s video was created just for the website launch. His profile appeared in the annual January Top Doctor’s magazine issue and previously in the October issue that featured medical specialists. The Top Doctor list is compiled by Castle Connolly Medical Ltd., to help guide consumers to America’s top doctors and hospitals. Doctors do not and cannot pay to be selected and profiled. Dr. Chudik was first named to the Top Doctor list in 2012. To view Dr. Chudik’s new video and online profile, visit https://www.chicagomag.com/Professional-Profile-Sets/index.php?id=7/. Dr. Chudik has been restoring his patients’ mobility and lives with his pioneering innovation in arthroscopic surgery for 17 years. He holds six patents for minimally invasive arthroscopic surgical techniques, instruments and implants for shoulder and knee sports injuries including shoulder rotator cuff, labral and cartilage tears and anterior cruciate ligament (ACL), meniscal and cartilage injuries to the knee. Patients travel the United States and internationally for Dr. Chudik’s orthopaedic expertise, his kind and genuine bedside manner and his willingness to do what is right for his patients with individualized treatment plans. Dr. Chudik is a partner at Hinsdale Orthopaedic Associates, and the Medical Director for AMITA Health LaGrange Memorial Hospital. He founded and is president of the Orthopaedic Surgery and Sports Medicine Teaching and Research Foundation (OTRF), a nonprofit 501 (s)(3) organization dedicated to funding research and education to help keep people active and healthy. Dr. Chudik earned his medical degree from the University of Chicago Pritzker School of Medicine, completed his residency in orthopaedics from the University of North Carolina Hospitals and was a fellow in sports medicine and shoulder surgery at the Hospital for Special Surgery, NY. To further his academic interests, Dr. Chudik is a clinical assistant professor in orthopaedics at Loyola University, Chicago, and conducts research at Argonne National Laboratory, Batavia, Ill., and at the Hines VA Hospital Musculosketal Biomechanics Laboratory, Hines, Ill. As a member of AAOS, AANA and AOSSM, Dr. Chudik teaches and served on committees such as the health policy and ethics committee to help establish policy and procedures in our changing healthcare environment. He is an expert reviewer for the Journal of Arthroscopy and Related Research, the American Journal of Sports Medicine and the Journal of Shoulder and Elbow Surgery. Dr. Chudik serves as a team and club physician for USA Swimming, Lyons Township High School, Hinsdale South High School, Nazareth Academy High School and Fox Valley Lacrosse. Dr. Chudik has convenient office hours Monday through Friday in Westmont, Ill., and Western Springs, Ill. To make an appointment with Dr. Chudik you can schedule online at www.stevenchudikmd.com/schedule-online/, email him at contactus@chudikmd.com/, or call his scheduler at 630-324-0402. 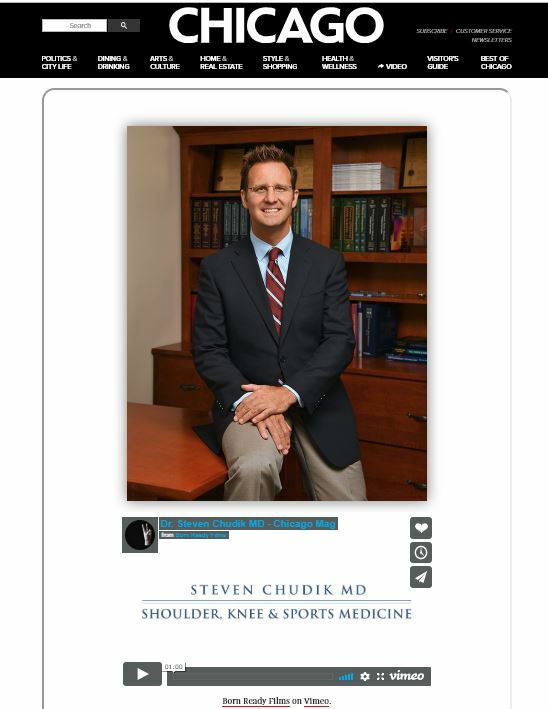 For more information about Dr. Chudik, visit his website www.stevenchudikmd.com where you also can view three videos on Dr. Chudik’s innovation, learn more about Dr. Chudik and experience a patient visit. To learn more about his nonprofit foundation or to contribute, visit http://www.otrfund.org.